1. Mix the oil, vinegar, salt, pepper and oregano in a big bowl. 2. Thread the mackerels on to skewers alternating with tomatoes, onions, capsicums and mushrooms. 3. Marinate the prepared skewers in the vinegar-oil mixture for 1 to 2 hours, turning from time to time. 4. Place them under a preheated grill and cook for 10 minutes. 5. Baste once or twice with the marinade. 6. Turn them frequently so its evenly cooked. 7. If the fish flakes easily, remove and serve on a bed of green salad garnish with sliced lemon. 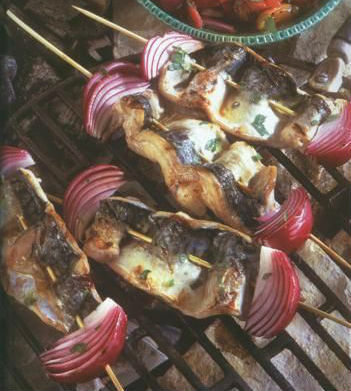 Feel free to comment or share your thoughts on this Mackerel Kebabs Recipe from Awesome Cuisine.